I’m a big proponent of keyword research. I’ve written extensively on the topic and even recently published a post outlining 13 different uses for keywords beyond the standard optimization. I’m not attempting to negate all those reasons here in this post, but I do want to provide a word of caution as to why keyword research data simply cannot be trusted. In fact, if you rely on that data too much, you’ll find yourself getting off track. And while your digital marketing campaigns may appear successful, it may not be translating into business growth. The biggest problem with keyword research tools is that the data is wrong. There is just no other way to say it. Now, they may vary in degrees of accuracy, but that’s just another way to say they vary in degrees of inaccuracy! It’s really not how right they are, but about how wrong they are. 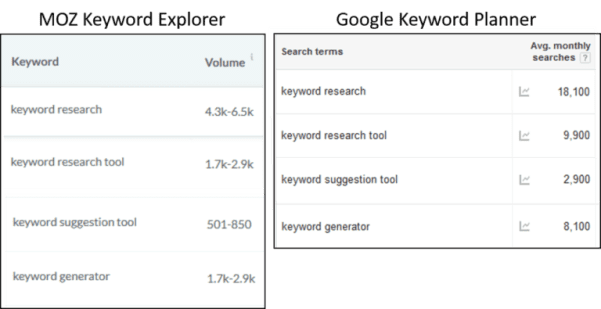 Ever wonder why you can look up the same keyword in three different tools and you’ll get three different search volumes? And not just that, but they can differ by hundreds of percent! Even Google’s keyword tool, which has direct access to its own search database, has never been wildly accurate. And with the recent changes, that data is even more skewed. All keyword tools provide inaccurate search volume numbers. They are really a “best guess” based on the information which the tool has access to. But these are the tools we have, so what do we do? Best case is to use the data as a comparison metric and nothing more. And the more data you have between tools, the better you’ll be able to sift through your keyword lists and discern which phrases will be more valuable than others. While all keyword search volume data is inaccurate, this is amplified when it comes to low-volume keywords. This becomes an even bigger problem as more searchers are moving away from searching with short-tail phrases. Voice search exasperates this even more with natural language sentences becoming the standard in search. In fact, even back as far as 2012 it was found that 16% to 20% of queries that get asked every day have never been asked before. That’s about 500 billion never-been-searched phrases per day. My point isn’t that we need to optimize for these searches, it’s just that there are a lot of searches being made that are not recorded. If you negate all low-volume phrases produced by your keyword research tool, you’re effectively eliminating over 20% (if not more) of potential traffic to your site. I talk a lot about keyword intent in the article linked above. And that is actually one of the uses of keyword research. But in order to find intent, you have to do some additional digging–the tools themselves don’t provide it, and many keywords are silent about searcher intent as well. Understanding the intent of the searcher is important because that shows you what information you need to provide in order to satisfy the searcher’s needs. If you have not figured out the intent of the search, you have no way of knowing whether the content will be valuable to the searcher. It’s always tempting to try to rank for the short-tail phrases that have high search volume. Whether your keyword tool gives you search volume for every variation of a phrase or combines related phrases into one, nothing is provided indicating the relevance of those terms. Many searchers–especially those who start with the long-tail phrases–search in phases. That is, they search first for the basic concept of what they are looking for. Then they’ll take a few seconds to scan through the results in order to go back and perform a more specific search. This pattern can happen two, maybe three times, until they feel that they have an accurate enough search to give them the results they want to look through. These searchers are using search to educate themselves on how to search better within that topic. With each search, they refine the next search based on what they found in the previous set of results. Keyword research tools don’t offer the data on how many searchers abandon that search and perform a better refinement. This creates a skewed search volume number. Despite the flaws in the data, keyword research tools are by no means worthless. 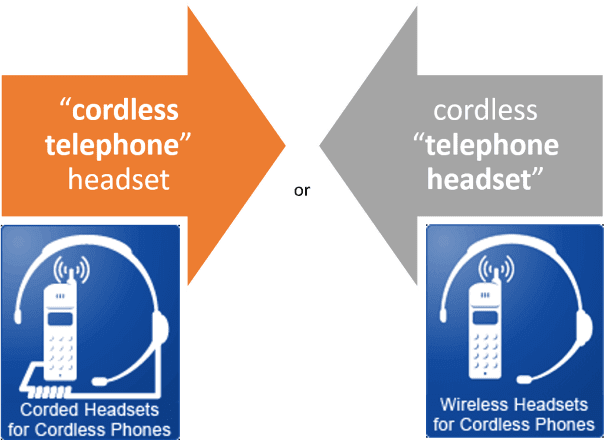 They are very valuable tools for uncovering terminology that you had never considered before. Despite the drawbacks, they provide relative data that you can incorporate into your strategy. But you do have to take that data with a grain of salt. So how do you get accurate keyword data? Let’s look at two sources. As a general rule, I like running PPC campaigns next to organic marketing campaigns, just to capture the traffic you wouldn’t otherwise be getting. But beside that, PPC offers the most accurate tool for assessing keywords and their potential. To assess the value of any keyword, there is no need to drive large amounts of traffic, just enough so you get a statistically accurate analysis. There are a couple of things you want to keep in mind when running these tests. You have to make sure the landing page is the same landing page that ranks (or should rank) organically. And you also have to mimic the title/description of the organic page as much as possible. Monitor the traffic that comes in. If you get good click-through rates and good conversion rates, then you have a winner all the way around. If not, something needs to change. You can also use PPC to test different titles and descriptions. If a change in PPC produces better clicks and conversion rates, you may want to consider applying that change to your organic pages. Finally, you can test different landing pages. If one page gets a better result than another, consider optimizing that for the keyword instead. Analytics provides another powerful tool for determining whether or not certain keywords are getting you the results you want. PPC definitely has advantages here, but analytic data can be just as important. Be sure to monitor bounce rates to pages and try different things to get visitors engaged. High bounce rates are a clear indication that the page wasn’t necessarily relevant. If you are not able to bring high bounce rates down, you may just be working with an irrelevant keyword. Be careful, however about taking analytics too literally. Analytics can only show you what is known, not what isn’t. Try to make decisions on what you can deduce with certainty or, better yet, test before drawing any permanent or costly conclusions. 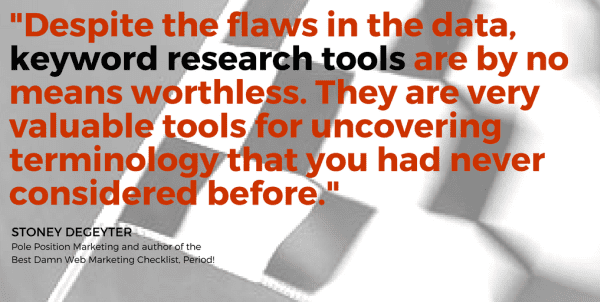 All tools have their flaws, so don’t assume your favorite keyword research tool is the coup-de-grace of data. All good marketing provides human interpretation and wisdom to know what to do with the data being provided. That doesn’t make tools unimportant to the process. Quite the contrary, really. They help you do things in a fraction of the time that you’d be able to do on your own. But ultimately, human wisdom and experience must make the decisions as how to incorporate the information being provided. That means relying less on your keyword tools and more on your own knowledge base. Wear the tools out, as far as I’m concerned, but don’t let them replace your own wisdom. 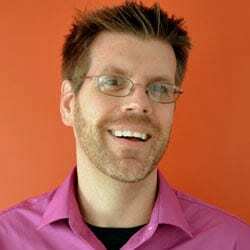 What challenges have you faced with keyword research tools? How have you gotten around them? Let me know in the comments! Stoney deGeyter is the author of The Best Damn Web Marketing Checklist, Period and my web marketing articles have been published on Search Engine Land, Web Pro News, Search Engine Journal and Visibility Magazine. I am also the main contributor at Pole Position Marketing’s E-Marketing Performance blog. Maybe you are right Stoney. Different tools with different value. your comparison is very useful . Well, of course I’m right! 😉 The point isn’t that keyword research tools cannot be used, just that they cannot be relied on. More data is required. Check out list of tools for the purpose of marketing, advertising, SEO, CRO, Saas, web development, infographic, etc. all available at BetaPage. Curious about why you wrote, “High bounce rates are a clear indication that the page wasn’t necessarily relevant.” Isn’t it possible the page was perfectly relevant and was the only page the user needed? Thanks for the comment Barry and yes, you are correct in some circumstances. But outside of blog posts and contact us pages, those circumstances are exceedingly rare. End even in the case of blog posts, most people want visitors to engage with their site so the goal is to facilitate that engagement by getting the visitor to commit to the next course of action, whatever that is. So even high bounce rates on a blog can be a negative. Thanks so much for contributing, Stoney. It’s an honor to have you here on the Orbit blog! And the timing is perfect. We’re in the process of overhauling our approach to keyword research. I appreciate all the insights you’ve shared here. Agree, today these tools are really inaccurate and not relevant enough to get needed response. So, thank you for your advice. Think it’ll help me a lot. 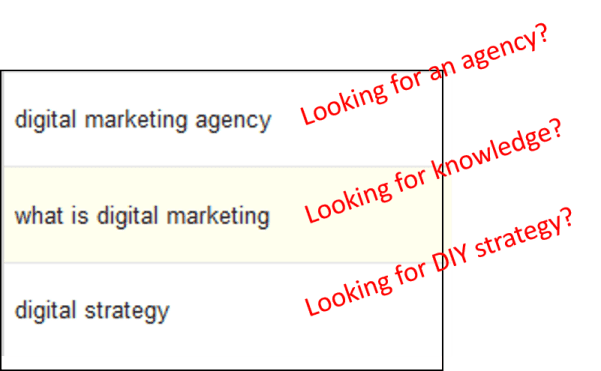 I’m working as a content writer and sometimes I have to find relevant keywords to improve my content and make it more expensive in the eyes of the consumers. I have to say, their tools are the best I’ve ever used so far. I’ve used Moz, Google’s keyword planner and a few others, but SEMrush really did it for me. It’s true, data isn’t perfect, but they certainly give you a push in the right direction. Finding related keywords, analyzing what your competitors are doing and getting deep insight is made a lot simpler with their tools. Just my opinion, but I wouldn’t go without them.